Agents in Canada's major cities can expect a steady stream of business as a new report suggests urbanization morphed the interests of Canadian buyers to prefer city dwelling over sprawling suburbs. “The American dream is dead,” Ben Myers, senior vice president of market research and analytics at Fortress Real Developments, at the launch of a new report from the Urban Land Institute (ULI) and Pwc. "People are making the choice to be in smaller spaces in newer builds with more amenities." The report, Emerging Trends in Real Estate: Canada and the United States 2015, published earlier this week, showed that the global urban population is expected to increase 72 per cent by 2050 and that 1.5 million people are added to the global population every week. It found that, as more people move into city centres for work and lifestyle purposes, urbanization is now considered the “new normal,” offering opportunities and value for buyers around mixed-use property and blurring the lines between residential and commercial developments. “The market shift towards urban cores and transit supportive communities is a unique opportunity to maximize the value of new public infrastructure investment in major cities across the country,” said Richard Joy, executive director at ULI Toronto. Experts worry about the impact of rising interest rates on the market for single-family homes. The market is continuing to tighten, with a lack of supply of building lots and many baby boomers opting to stay in their homes rather than sell. 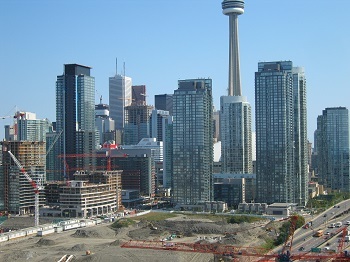 The urbanization trend and the tightening in the single-family housing market have fuelled the condo boom in Toronto and other Canadian cities, such as Calgary. The next phase involves young urban condo dwellers starting families and seeking affordable housing, a market need which will be addressed by purpose-built, multi-residential rental developments. Canada’s aging population means seniors’ housing offers attractive opportunities in the future. The report suggests that some investors may partner with firms specializing in facility management. PwC also highlighted that Calgary and Edmonton are the top two real estate markets in Canada, with both scoring well for investment, development and housing. Toronto slipped in just ahead of Vancouver to hold the third ranking in this year’s report.